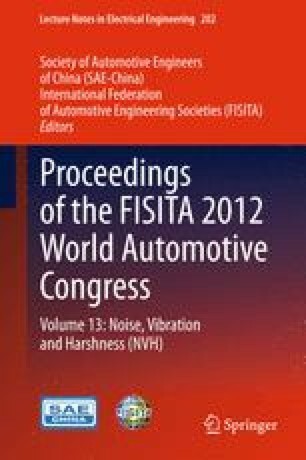 To study the influence of the subframe mounting system on vehicle interior NVH performance, to optimize a subframe mounting system in order to reduce the interior booming in the early development phase, are the research purpose. An analysis method including both CAE simulation and testing is used to establish the subframe mounting system model in this chapter. Impact of the subframe mounting system on interior noise and vibration is analyzed in the aspects of the subframe mounting stiffness and the added mass, as well as the subframe structure is optimized simultaneously. The optimized subframe mounting system is validated by the testing, and the results show that the interior booming and vibration are significantly reduced. Subframe mount stiffness and the added mass have influence on the interior NVH performance. Matching the subframe mount appropriately would improve the NVH performance. In the process of writing this chapter, doctor PANG Jian, vice president of Changan Auto Global R&D Center, and WU Guo-ming deputy chief engineer give me much guidance. Thanks for their help!